The southern flanks of Greenstone mountain were the best places to find colored obsidian. 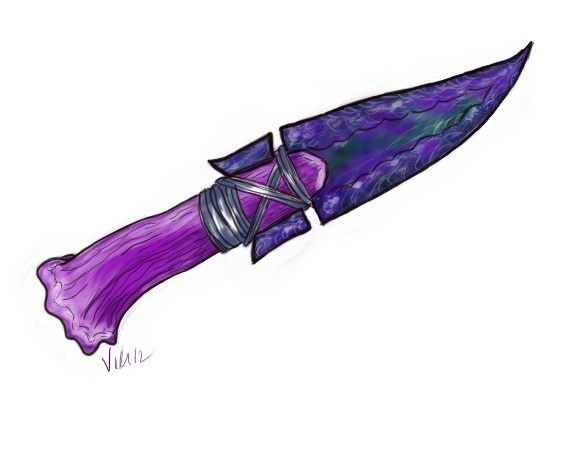 The hills and mountains north above Whitewing Lake were rich with glossy black stone, but for the richly colored obsidian in hues of green, red and purple, or even the most rare clear obsidian, a hunter had to look to the slopes and hills that lay between Greenstone Peak and Lookout Mountain. Once there, a knapper could often find fist-sized chunks of the stuff by just walking the mountainside, or by hunting along the creeks and streams running down from the steep slopes. But the very best obsidian was still found the hard way � by digging it up. Lynx's very last wooden digging stick was shaped of hard oak and had been wrapped in strips of wet rawhide which had then dried hard and stiff for support. It was as thick as his arm, and it lasted longer than the rest Lynx had carried to the mountain. He had excavated most of the badger-sized boulder when the stout tool snapped in two with a crack so loud that Crosscut and Frog both came to peer over the edge of the digging-pit at him. He waved the wolves off and wiped sweat from his face before kneeling to pry at the boulder with the sharp, broken haft of his digging stick. He jabbed at the dirt around its base, so close to digging it free that he could almost taste success. "How's it going?" he heard Frost call. Moments later she appeared at the same place where the two wolves had been, her long braids hanging down past her shoulders as she looked down at him. Then she sat and swung her legs over the ledge, swinging her feet as she inspected some of the obsidian flakes and chunks she had just gathered from the ravine nearby. "Nearly got it," Lynx said. He knelt in the mud at the bottom of the pit and applied his shoulder, pushing his whole weight and strength into wrestling the obsidian boulder free. He felt the last resistence give, and the big chunk of rock came free. Lynx knelt where he was for a moment, panting for breath, then hefted the badger-sized boulder up in both arms. He carried it to the branch-ladder that lay at a gentle angle against the wall of the greentstone pit, and began to carefully carry his burden out of the pit. Frost scrambled to help him, and together they lay the heavy rock on a patch of grass near the pit's edge. Lynx cast himself down to rest, feeling the warmth of the morning sun on his bare chest and arms. Frost's deft fingers stroked the side of his face for a moment, flicking away a swipe of mud, and then she knelt over the boulder, inspecting the result of his labors. "Oh, this one is pretty!" she said as she wiped away the blanket of dirt and mud to expose the glossy rock beneath. "There's a good bit of green, but there's purple and red stone here as well!" Lynx pushed himself up onto one elbow to take a closer look. The colored obsidian was just as sharp and brittle as the common black was, but elvish artisians favored it for its relative rarity.Sometimes the large boulders would provide clusters of solid color; sometimes it would be threaded with black, and sometimes it would swirl together. He enjoyed hunting for the boulders simply for the joy of not knowing what the earth would provide him next. And, of course � because his beloved loved the colored stones. Lynx reached out now and stroked Frost's bare midriff, smiling to know that inside her now, their child of Recognition grew. It would be some months now before their child began to show or shared its soul name. Frost's lips twisted in a smile, and she batted his hand away as it slid north toward her breasts. "Work first," she said, the sternness of her tone undermined by the promise of her smile. "I want to clean this off and start chipping, to see what all we've got here. I hope there�s more of that purple � I want to make a new knife from it, if there's enough here." The boulder he had found would likely have enough for a hand of knives or spearpoints, depending on the fault lines within the big stone. And from the process of knapping the boulder down to size and shape would come enough good shards and flakes of obsidian to make a couple of quivers full of arrowheads. He and his mate would camp here in a tree-shelter along the stream course where it trickled out of the ravine, and before they left for home, they would work the boulder down into shards and dust, spear points and knife blades. And they would hunt from the forest, fish from the streams, and make love under the sun and stars � enjoying the mountain that, for a time at least, would be theirs and theirs alone. They found the old obsidian pit, so overgrown with brambles and berry vines that Brightwood had to coax the greenery aside like a nest of snakes. "Cloudfern and I continued to come here regularly," Farscout said, while Brightwood eyed their discovery. "But when the Painted Faces arrived, we stopped coming so often. The humans make trips out to Greenstone Mountain and the shores of Sky Mirror Lake at least once a year, to collect stone for their own use. So it's safer to gather obsidian along the Clickdeer north from here, where the humans don't go." "But it's almost all black stuff north of here," Brightwood said. "It seems a shame to leave all of the pretty rocks to them." Farscout pulled off his quiver, then his leather tunic. "They're not here now," he said, with a smile for his lifemate. "We have time yet, before we have to return from your long walk. Let me fish around and see what there is down there left to be found. If you can shape me some digging sticks..."
Brightwood's smile was instant. Farscout watched as his Recognized, thick-bellied with their unborn child, turned to find a suitable piece of wood to shape for him. He smiled himself. He knew how much his lifemate enjoyed the colored stones, and he was grateful for the opportunity to find them for her again.